The Aztec Empire was formerly established in 1428 although even before that it was constantly at war for supremacy with the neighbouring city-states. Like other empires in history, the Aztec Empire was also divided into various social classes, with the upper classes enjoying more privileges than the rest of the people. With the establishment of the Aztec Empire, the Aztec class structure became more and more sophisticated with laws reflecting the rights and responsibilities of different classes. According to the historical sources, the Aztec class structure was so elaborate that it impressed the Spaniards as much as the architecture of the empire. The Aztec class structure consisted of the classes of nobles known as pipipltin, commoners known as macehualtin, and the serfs and slaves who were at the lowest rung of the society. The noble class was further sub-divided into the classes of royal families, warriors, lords and priests. Each section of his hierarchy of Aztec class structure had its own set of customs and rules which were expected to be followed. For instance, the priests were expected to remain celibate and to refrain from alcohol. Different kinds of punishments, including death in extreme cases, were reserved for people transgressing from these rules. 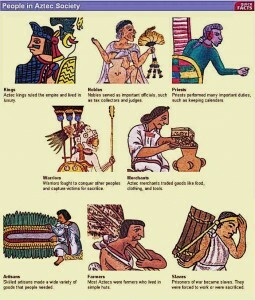 Different kinds of rules and laws applicable to different social classes were laid down in Aztec code of laws. The nobility mostly enjoyed privileges in the form of better education and tribute from the common people. Commoners could be sold as slaves if they failed to pay tribute or if they indulged in crime. This tribute could be in the form of gold as well as labour for which the commoners could not refuse as per the law. Another rule of Aztec class structure was that while traders could amass as much wealth as they wanted, they could not display it like the nobility. The formation of Aztec class structure can be traced back to the migration of nomadic hunter-gatherers from the north during the first millennium CE. Agricultural societies with primitive social structures developed later on under the influence of the classic Mesoamerican societies. With the passage of time, city-states were formed which competed with each other for influence. By the time the Aztec Empire established its hegemony over other city states, a fairly sophisticated Aztec class structure had already developed. This structure was then constantly refined with the passage of time. Aztec emperors and rulers, as would be expected, were at the top of the Aztec class structure. The ruling emperor was considered the direct descendant of gods or divine beings and thus enjoyed virtually unlimited privilege and power. This was true not only in the political sphere but also in the religious domain. It was the emperor who decided about wars and the amount of tribute to be extracted from the subjugated city-state. The rulers actively took part in the religious ceremonies in order to legitimise their divine descent and religious importance. Upon the death of an emperor, the new emperor was chosen by a group of high-ranking nobles, although he had to be from the same family. After the royal family, the social class of importance comprised of government officials, priests, and various high ranking officials. This also included the warriors who were categorised into various societies. The government officials included smaller rulers of the subjugated city-states who paid tribute to the emperor in the capital city of the empire, Tenochtitlan. The noble class consisted of the land-owning elite which had the exclusive privilege of using certain types of clothes and using certain type of jewellery. The priests were responsible to take care of religious festivals and ceremonies which were a common feature of Aztec society. 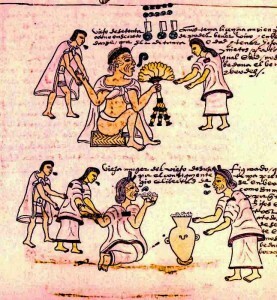 The bulk of Aztec society consisted of the commoners. This included farmers, artisans, merchants, and low-level priests. The merchants enjoyed special status within the commoners because of their importance and wealth. Their social status was somewhere between the common people and the nobles. The farmers in this class were those people who owned some amount of land but not as much as the nobles. The importance of the farming class was further declined because of the fact that only 20% of Aztec population indulged in farming, with the rest being warriors, artisans, and traders. The petty peasants in the Aztec society were those who were similar to the serfs in medieval Europe. They did not own any land of their own and cultivated the land of their masters in return for some amount of harvest. Just like the serfs in the medieval Europe, these petty peasants were bound to the land they cultivated and could be sold with the land to the new owner. Among the free members of society, these Aztec peasants had the least rights. Slavery was important in Aztec society mainly because of its religious significance. Slaves, as would be expected, had few rights of their own. For instance, they could buy their freedom and their progeny was considered free. Commoners who indulged in crimes or failed to pay tribute could be sold into slavery. Additionally, war captives who were not used in human sacrifice also became slaves. Finally, commoners who could not pay their debt for some reason could voluntarily sell themselves into slavery. Slaves could marry and have children, and their children were considered free. The Aztec Empire had a sophisticated class structure which was refined under the law after the formation of the Aztec Empire in 1428. According to Aztec law, different classes in Aztec class structure had different privileges and rights. For instance, the nobles had the right of service and tribute from the common people. The common people could have their voice heard in the city-councils. At the lowest rung of Aztec class structure came the petty peasants and slaves who had least amount of rights. Warriors and priests had rights on par with the Aztec nobility while wealthy merchants also had social status higher than the common people.